How to make turmeric paste to stir in your Golden Milk. Golden milk or golden tea, a super healthy drink that can help improve your health. 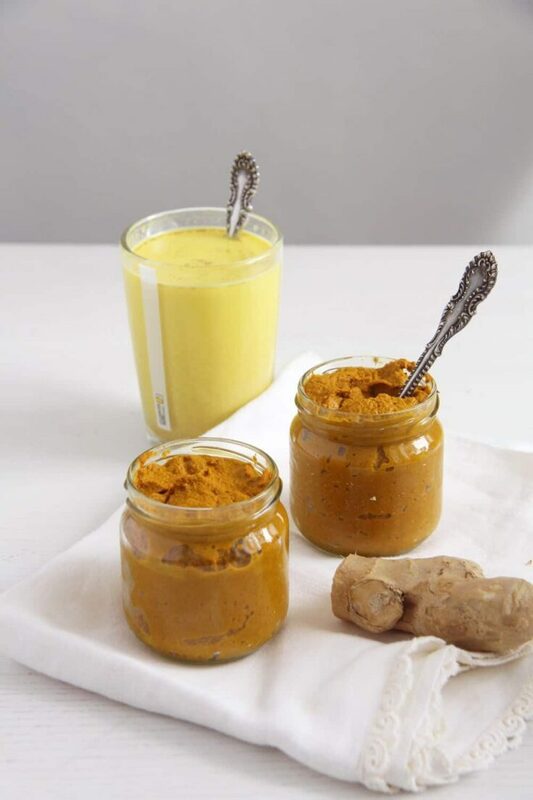 This recipe for turmeric paste for golden milk makes it easier for us to enjoy this wonderful drink on a daily basis without having to start fresh every time. Known as the “spice of life” in India, turmeric seems to be considered at the moment as one of the most powerful herbs in the world. Its health benefits have been analyzed in thousands of studies apparently and most everyone seems to agree that including turmeric to your diet can prevent or improve the symptoms of various diseases like cancer, type 2 diabetes, inflammatory diseases, metabolic diseases, neurological diseases and so on. For example, laboratory studies have shown that curcumin, which is the most studied component of turmeric, “is able to kill cancer cells and prevent more from growing. It has the best effects on breast cancer, bowel cancer, stomach cancer and skin cancer cells”. Another study regarding one of the diseases most affecting our modern society shows that “curcumin is 400 times more potent than Metformin, a diabetic drug, in improving insulin sensitivity which can help reverse Type 2 Diabetes”. This is of particularly interest for me, as I have been recently diagnosed with PCO (Polycistic Ovary System), which among other things, increases the insulin sensitivity and the risk of getting type 2 diabetes. To help against it I have been taking Metformin for several months now, but knowing that I could improve the symptoms of PCO with the help of something so natural as turmeric is amazing. So including turmeric in your diet can only be of advantage for your health. The most common way of using turmeric is, of course, in curries, even when using an already made curry paste or curry powder, I like adding an extra teaspoon of turmeric. It’s not only healthy, it looks pretty as well… :). I like to use this Organic Turmeric Powder. Recently I came to discover Golden Milk. I made it fresh a few times and enjoyed it, together with my husband, from time to time, in the evening or on a weekend morning. 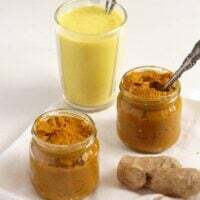 Then I found an article stating that it is possible to make a turmeric paste, which will allow you to enjoy the Golden Milk regularly without having to start fresh every time. I tried 3 or 4 versions of it and found the following to be the tastiest. It combines lots of turmeric with black pepper (which is said to increase the health benefits of turmeric), cinnamon, nutmeg, fresh ginger and coconut oil. The amount will make two small jars, which are enough for a few weeks of regularly drinking golden milk or golden tea. 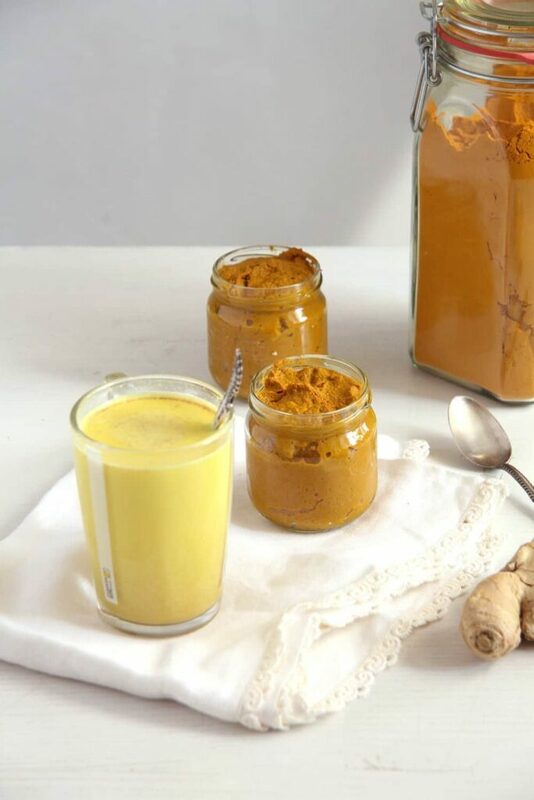 Making this recipe for turmeric paste for golden milk could not be easier. Step 1: Pour the water into a small pan and bring to a boil. Step 2: While the water is coming to a boil, prepare the rest of the ingredients. Finely grate the ginger. Give it to a bowl and add the turmeric powder, cinnamon, black pepper, nutmeg and coconut oil. Step 3: When the water is boiling, add the dry ingredients and stir continuously on a medium-low heat for about 3-4 minutes. If the paste is too thick, add a small splash of water and continue stirring. Step 4: Transfer the paste to the clean jars, seal and let cool. It will keep in the fridge for a couple of weeks. The moment I give the dry ingredients to the water I whisk everything. Once the paste thickens slightly (it will happen pretty fast), I continue stirring with a wooden spoon. But keep in mind that turmeric stains, so the wooden spoon will become orange (all my wooden spoons are orange by now…). I prefer to make the turmeric paste for golden milk in a small non-stick saucepan. The risk of the turmeric paste sticking to the bottom of the pot dissapears, the mixture is easier to mix and the saucepan super easy to clean as nothing will stick to it. To make the golden milk, gently heat one cup of milk of your choice. The milk should be lukewarm and not hot. Whisk in 1 heaped teaspoon of the turmeric paste and the honey or another sweetener of your choice. Serve immediately. You can use any milk you like as a base for the golden milk. Coconut milk is considered to be the best choice due to its content of lauric acid, studies showing that lauric acid might promote weight loss and improve insulin sensitivity and glucose tolerance as well. But I have also used normal milk, almond milk and soya milk. The choice is yours. I am normally not sweetening any of my drinks, but in this case, I like adding ½ to 1 teaspoon honey to the milk, I find it takes the edge of the turmeric taste a little bit, I do like it, but in such a concentrated amount, I feel it tastes a bit “raw” and the honey really balances the taste perfectly, it is like drinking a nicely spiced chai. 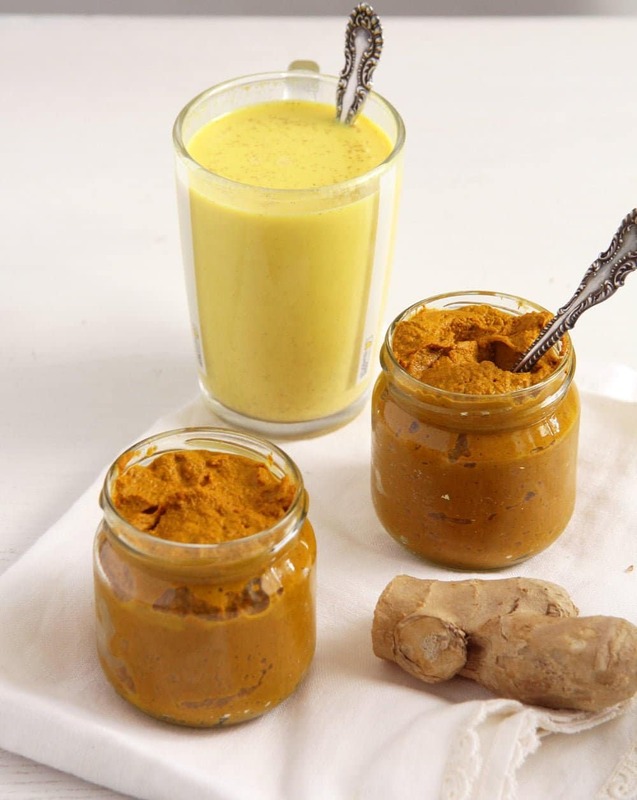 I posted this recipe for turmeric paste for golden milk a long time ago, in September 2015. Ever since I must have made hundreds of little jars already. I even make it regularly for a couple of friends. 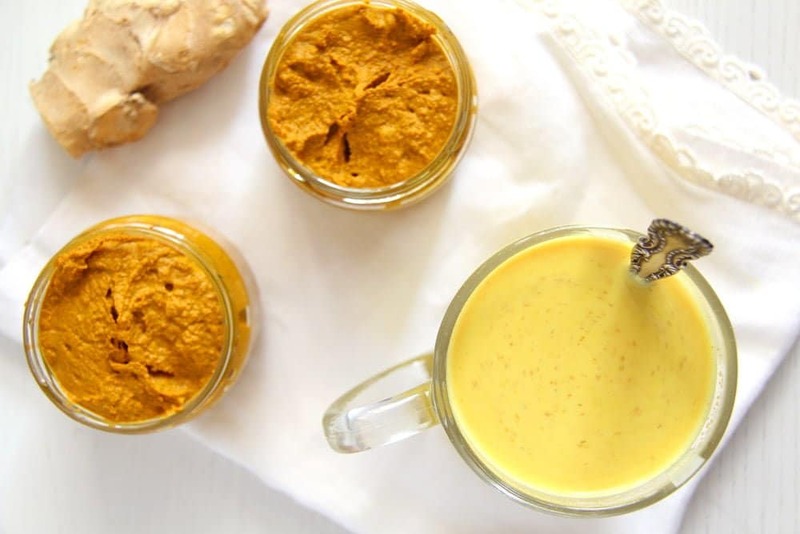 My husband and I use the turmeric paste on a regular basis as well, but I have to admit that our golden milk transformed into golden tea a long time ago. I was never a big fan of drinking any sort of milk, I have nothing against cooking with milk or using it for müsli, but I never drink it as it is, I just don’t like it. Same thing with most kinds of nut milk, except coconut drink or almond milk maybe. But as these particular sorts of nut milk are rather expensive, I have long searched for alternatives to enjoy the turmeric paste. Nowadays, I almost always drink my turmeric paste in form of tea. I usually make a large thermosflask of turmeric tea in the morning and enjoy it hot all day long. Boil 3-4 cups of water in a kettle. Give the water to a pouring jug. Whisk in 2 heaped teaspoons turmeric paste, make sure you stir well. Add honey and lemon juice to taste. I usually add 1 1/2 teaspoons honey and the freshly squeezed juice of half a lemon. Keep a teaspoon into your drinking cup and stir the tea before you take a sip. This is my favorite way of enjoying the turmeric paste. Do give it a try! Another way of enjoying this paste is by stirring one cup of warm milk with the paste and then using this liquid to pour over some homemade muesli, letting it cool and adding some chopped fresh fruit. And sometimes, when making a curry or a soup, I like adding some of the turmeric paste as well. I feel it tastes best when added to carrot soup, lentil soup, dhal or chickpeas. 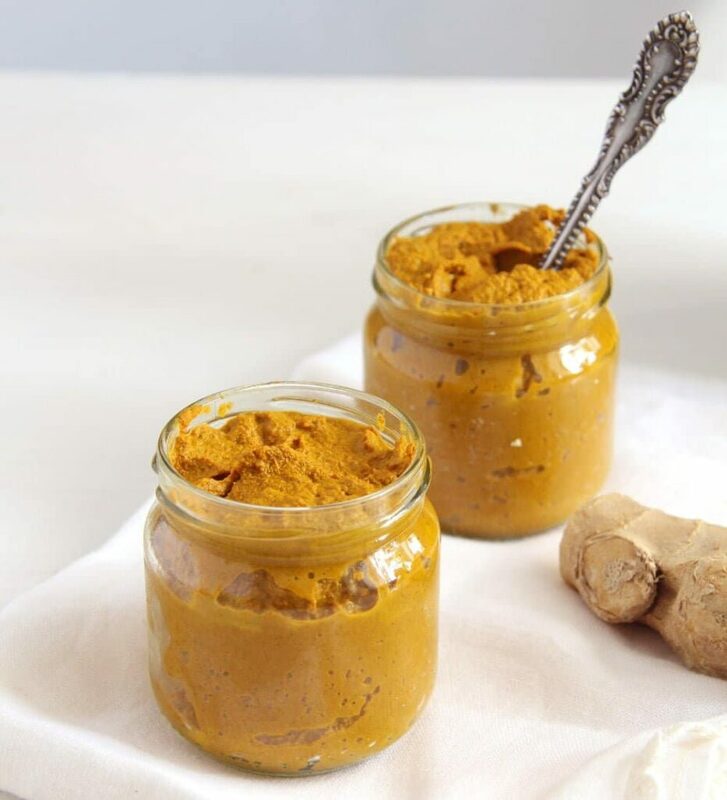 How to make turmeric paste to make golden milk or golden tea. Pour the water into a small pan and bring to a boil, preferably use a non-stick pan. Finely grate the ginger and add it to the pan together with the turmeric powder, cinnamon, black pepper, nutmeg and coconut oil. Give the dry ingredients to the water. Whisk well for about half a minute until it becomes difficult to whisk. Continue stirring continuously, using a wooden spoon, on a medium-low heat for about 3-4 minutes. If the paste is too thick, add a small splash of water and continue stirring. Give the paste to the clean jars, seal and let cool. It will keep in the fridge for a couple of weeks. To make the golden milk, gently heat one cup of milk of your choice. The milk should be lukewarm and not hot. Whisk in 1 teaspoon of the turmeric paste and the honey or another sweetener of your choice. Serve immediately. Stir 1 teaspoon turmeric paste into a cup of hot water. Add honey and freshly squeezed lemon juice to taste, it should have a strong sweet-lemony flavor. Use a small non-stick saucepan, the risk of the paste catching to the bottom of the pan dissapears and the pan is very easy to clean. Turmeric stains, so if you use a wooden spoon, the spoon will become orange. It’s a great idea. My husband doesn’t like turmeric and having a turmeric paste would make my life easier. Golden milk sounds great too, I didn’t hear about it before. It does make it easier, I was really not bothered to make the Golden Milk so often before but now that I only have to stir in the paste, we have almost every day. That’s my favourite way of drinking milk in winters but I never added cinnamon or nutmeg. Sorry to hear about your health condition… I hope turmeric helps you! It’s always such a relief to learn one can skip the drugs and take something which isn’t a burden for the liver…. (especially if it’s so delicious!). I don’t cook with turmeric for health reasons but for the flavours it adds (and also for the colour sometimes….) and I even add it to Japanese dishes. It seems to go with so many different dishes and cuisines from all around the world…. I love it even more since I learnt how healthy it is! Plus these jars would make the cutest gift ever!! You post is so timely! Just yesterday I read a summation article of the studies on turmeric and one of the things that has been scientifically proven is, for it to have the advantage to our health, it must be combined or taken with a fat and, even better, a fat and black pepper. I see you have both in your recipe. Having a couple of inflammatory autoimmune diseases, I’ve been considering consuming more turmeric, so making this paste is a must! Thanks!!! Wow! I’m impressed with all that information here. I didn’t know black pepper increases the positive effect of turmeric. Will have to use them together. Turmeric is my new obsession but have never heard about turmeric paste. And golden milk is such a super drink to have in the morning. Thank you for this recipe. Other recipes I have looked at use dry ginger but I feel fresh is the way to go. I also tried using a full mug of organic coconut milk with the paste but just too darn thick in consistency for me. What does work is half coconut milk and half water. I have a lot of joint pain in my 66 yet old body so i hope I will be able to detect some relief after drinking my nightly cup of golden elixir. I am glad you like it, Rebecca, and I hope it will help you. I haven’t tried this with coconut milk, but plenty of times with almond, rice or soy milk. And I like stirring some in my smoothies in the morning, I do it all the times. How long does this last and does it need to be refrigerated? Depends on how often you use, I have never kept it for more than 2 weeks though. And you should keep it in the fridge all the time. So easy and delicious! I used hemp milk and strained the milk before I drank it (remove the ginger chunks). I can see myself having this nightly all winter. Hopefully this will help me sleep and feel better. Thank you for your comment, Carol, I am so glad to hear you made and liked the turmeric paste. I do hope it will help you feel better. So easy to make, looking forward to the benefits of turmeric I’ve been reading upon. I used to make Golden Milk by a single serving, but it was such a process for one cup, this paste will make it easier and more enjoyable knowing it’s right in my frig whenever I want it. Thanks so much!! 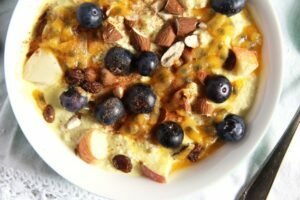 awesome recipe; i am addicted to golden milk – i was just wondering how much the recipe would change for adding fresh turmeric as well as fresh ginger? I am glad you like it, Owen. I’ve never made it with fresh turmeric because fresh turmeric is hard to find. The ginger I use is fresh. Let me know if you make it with fresh turmeric, I can imagine it tastes even better. thanks for the prompt response; i’ll see what i can do with fresh turmeric – will need to scour google for ways to prepare it as i’m quite the novice to say the least. if i manage it, i will follow up here and provide the amount required. 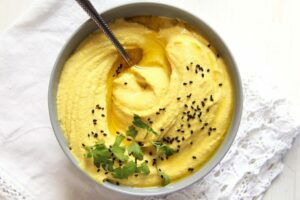 Any thoughts about fresh turmeric vs powder and how much to use for this recipe? Thanks! Sorry Melisa, I wanted to make this paste with fresh turmeric as well, problem is it seems impossible to find the fresh turmeric at the moment around here. Maybe I will have to order it online and give it a try. Oh, that’s too bad. Not sure where you live, but I find it pretty regularly at Vietnamese markets and sporadically at our local natural foods chain. I live in a very small village in the middle of Germany, the closest largest town is 60 km away… So no chance of an Asian foodstore around, I am afraid. We don’t even have a farmer’s market… I found fresh turmeric a couple of times in a larger supermarket, but I have been asking for it for at least 6 months now and nothing, they keep telling me that they will have it soon again, but it doesn’t seem to happen. I’m actually in the process of making an ‘as fresh as possible’ recipe for just the latte (no paste) and have found that grating 2 medium sized pieces of fresh Turmeric does the trick nicely for 1 litre (4.2 cups) of latte. not sure how this would translate for the paste itself, but I would just experiment and see how it goes. Wow, Owen, thank you so much for your reply. That would be great, Owen. Thank you! I know this post is over a year old but I’d thought I’d add my two cents. Turmeric is fat-soluble, meaning you don’t get the health benefits unless it’s bound with fat. I made your recipe but added 60ml (1/4 cup) of unrefined virgin coconut oil as the binder. I cooked the coconut oil, turmeric, ginger, and black pepper for 4 minutes on a low boil. I added the remaining spices and simmered for 2 minutes. I poured in the cashew milk and whisked until warm, about a minute. I found with the coconut oil I didn’t need honey as it was sweet enough for me. Some of my friends add honey. Your combination of spices makes a wonderful drink. It’s my go-to Golden Latté! Thanks for the link to your recipe, if you have others I’d love to try them out. Thanks so much for posting this recipe. I’ve just heard about Golden Milk, (and that it should be taken with black pepper and a good fat, olive oil or coconut oil, etc.) My hope is that it alleviates some Fibromyalgia and Migraine pain. We’ll see! So, if I plan to add 1/2 tsp honey to 1 serving, I could add 1/2 Cup of honey to the paste recipe. What do you think about this? Thank you for your comment and I do hope that turmeric will help alleviate some of your health problems. Concerning the servings you can get out of this paste, I’ve never really counted how many teaspoons the recipe contains, but I will do so tomorrow as I plan to do a new batch anyway. If you check again on Sunday or Monday, you will find the answer. Concerning the honey – I really don’t know. Theoratically I would say that there should be no problem, I am thinking here about refrigerator jams made with honey, which keep for a couple of weeks in the fridge as well. But I cannot say if that would affect the health benefits of the turmeric paste. Until now I have only added the honey to the milk or tea itself. Sorry for the delay. I have counted and got 35 teaspoons out of this recipe, so 35 cups of golden milk or tea. Thank you very much for this information. I appreciate your quick replies. I hope to make my first batch this weekend. It increases the bio-availability (what your body uses) of tumeric by 2000%! I found out from my cardiologist that honey can increase your triglycerides (which are a warning sign for heart disease/heart attacks, similar to cholesterol). If you are routinely using honey, get your triglycerides rechecked after a month or so to make sure it is not shooting up….especially if you use a lot of honey. I am a nurse, and I didn’t realize that before. And tumeric can increase the effect of some cholesterol meds, so make sure your doctor also knows about homeopathic things like this that you may be taking or any vitamins or supplements. They just may need to adjust things for you, ie they put me on a lower dose of my cholesterol med. She doesn’t rule out the tumeric paste because it helps (I had blood clots in my lungs with pain ever since), but just adjusts things as needed. Tumeric is also a blood thinner, so don’t take it if on blood thinners, ie warfarin/coumadin, Xarelto, etc. It can really increase your risk of a bleed! Tumeric with Plavix/clopidogrel may or may not be okay so double check. I now drink my first mix of tumeric with honey and hot tea at noontime. I will refrigerate the tumeric paste. OK. Am i on the right track? Yes. Keep refrigerated. It will be good for at least 2 weeks. How about s milkshake in the summer! I don’t see the recipe on this page. I see the photos, ads, and article, but no recipe. Hi K. Thank you so much for letting me know, I probably would not have noticed that for a while. I’ve no idea what happened, but I’ve just fixed it now, the recipe is there again. 🙂 Have a nice Sunday. Hi Adina, I’ve tried making the turmeric paste, and prob I added too much water rather than the additional splash which you mentioned to add should the paste gets too thick. My turmeric paste doesn’t dissolve easily when I add it to drinks and it tasted bland. Also, can I substitute water with coconut milk when making paste to enhance the taste? Hi Adeline. I always whisk the paste when making a drink with it, after a few minutes it sets again, so I keep a teaspoon in the pot and give it another stir before each sip. It will not dissolve completely as it is made with ingredients which will not dissolve in water. If you find the paste to be too watery, you could try cook for a couple of minutes more until most of the water will evaporate. I would not make the paste with coconut milk, but use coconut milk to make the turmeric drink (not the canned coconut milk, but the pack variety similar to nut milk like almond milk or such things). I also add extra lemon juice,sometimes an extra slice of fresh ginger and some sweetener (honey, agave or maple syrup or whatever sweetener you prefer) to give it more flavor. Try experimenting with the flavor until you get the desired result, I never drink it plain either. 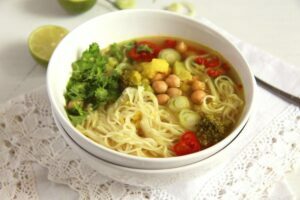 Ok, I was really dreading this…the taste of these ingredients blah…but I knew I had to do something about my health problems…omgosh, the taste is fabulous! Let pray it works…thanks! Welcome, I am glad you like it and I hope it will help you. Thank you for this recipe. You mentioned the taste of the turmeric being a bit raw without sweetener added to the milk. In the ayurvedic tradition the spices are gently heated in oil first to release their healing properties. If you try heating your spices with the oil first, then add the water, let me knkw what you think! Thank you, KareyLyn. I will try to heat the spices in coconut oil next time, I am really curious about it! I wil let you know. Merry Christmas! I can’t get my golden paste to get firm. Just be stays a liqid. What did I do wrong? Just cook it a bit longer until more water evaporates. Don’t forget to stir well, so that it doesn’t stick to the bottom of the pan. Did you measure all the we quantities correctly? I just discovered golden milk last week and this is going to be such such a time saver. Thank you so much. I just finished my first batch and discovered I had no nutmeg, so I added some ground cardamon. And some vanilla scrapings…so now it’s a golden chai! I can’t find fresh power at this time, what about the turmeric, you find at super market in the spice section? Will it work as well for theses recipes? Hi Donna, I don’t make the paste with fresh turmeric, but with plain ground dried turmeric, the one in jars in the spice section. Hi Adina, I just wanted to let you know that I love this recipe. I don’t know how many times I have shared your link. I use it in my coffee most mornings and my grandson loves Golden Milk. My Ortho doc wanted me to use turmeric for inflammation, this is my medicine!! Hi Jane. I am so happy to hear it. Thank you very much and all the best. Adina – this recipe is FANTASTIC. Thank you so much!! I often get a Tumeric Latte from a restaurant called Goodies here in Berlin. I crave it daily and never thought I’d be able to replicate it — but you nailed it! We have just moved to Germany (from the US) and I’m so happy to have stumbled upon your site. Tschüss! I have heard of golden milk, but never tried it before now! I Love it!!! Thank you so much for sharing. I will have to try it in some recipes too. You’re welcome, Trina. 🙂 Thank you for the feedback. Hello, I’d like to use fresh turmeric root instead of powder. How much root should I use to make the turmeric paste? Hi. Sorry, I have never made the paste with fresh turmeric because that’s not available around here. I hope you try it with turmeric powder though. What size jar did you use Adina? I want to make this for gifts this holiday season! Thanks! Hi Lisa. I use small jars, which used to contain other spices. I have just measured, about 150 ml/ 5 fl.oz/ a bit more than 1/2 cup capacity. You can use whatever cute little jars you have. Hi Mag. You don’t need garlic to make the golden paste, that would be terrible!!! 🙂 🙂 In case you meant ginger powder, I have only made the paste with fresh ginger. You could try substituting fresh with 1/2 teaspoon ground ginger, but I cannot say how that will taste. Just try! Hi Valerie, I am so happy that the turmeric paste can help you. The residue is normal. I really cannot give advice about the essential oils because I have never used them. You are welcome, Rose, this is really a time saver for me too. I almost always have the paste in my fridge.